We're more dependant on our mobile devices than ever before. Annoyingly, while our use of mobile phones has increased, their battery lives haven't, and running out of juice when you need to make an important call or check your emails can be a nightmare. 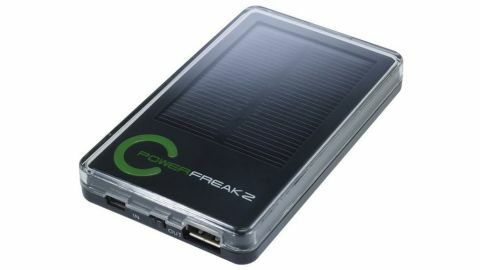 The Powerfreakz Evolution 3000 Solar Portable Charger contains two solutions for this. The first is that you can plug it into a mains power supply. The unit charges itself up, then you can unplug it and carry it with you. If you run out of battery power for you mobile device, you can plug it into the Evolution 3000 Solar Portable Charger and use it to charge the device. It comes with a number of adaptors for various devices such as iPhones, BlackBerry handsets and HTC smartphones, among others. There a great selection that comes with the package, and chances are there'll be a correct adaptor for you. If not, you can buy additional adaptors from the Powerfreakz website. After charging the Powerfreakz Evolution 3000 Solar Portable Charger, we plugged it into an iPhone 4S that had run out of battery. The Evolution 3000 Solar Portable Charger was able to fully charge the iPhone, and even had power left over for a second partial charge of the iPhone. While that would be impressive enough to warrant a recommendation, the Powerfreakz Evolution 3000 Solar Portable Charger also has a solar charging capability. This is very useful if you forget to plug the Evolution 3000 Solar Portable Charger in to the mains before you take it out of the house, and it works pretty well. As you'd expect, it doesn't offer as much power as when it's been plugged into the mains - it gave an iPhone 4S just over a quarter of a battery worth of power - but there's no denying how useful this device could be. It's a good price as well.